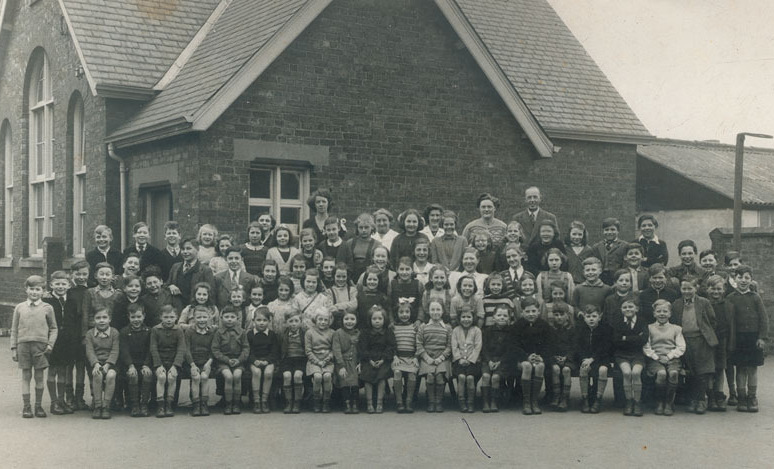 This picture, kindly loaned by Mrs Mary Kay, nee Hardcastle, of Eastrington is of the whole school in 1952. It was taken in the playground outside the infants' classroom with the canteen in the background. Back row: Mrs White (teacher), Mrs Leadill (teacher), Miss Smith (canteen), Mrs Lilley (canteen), Mrs Ward (office), Mr Bramley (headmaster). Fourth row: Colin Wilburn, Alan Malcolmson, Roy Chapman, Eunice Flint, Dawn Dove, Betty Brown, Pat Crewe, Alwyn Wraith, Doreen Crewe, Joan Gilbert, Rosemary Bradshaw, Francis Kirk, June Gilbert, Doreen Wilson, Pat Lilley, Audrey Binnington, Robert Jackson, Brian Laverack. Third row: Dave Hoggard, Irvin Robinson, Marjorie Lilley, Evelyn Brown, Mary Hall, Janice Flint, Marie Brown, Sheila Laverack, June Brown, Berenice Greenwood, John Gaskin, Alec Wraith, Peter Kirk, Norman Kay, John Holt. Second row: Michael Timm, Richard Leadill, Jack Young, Terence Thirkill, Tony Kay, Barry Malcolmson, Roy Metcalfe, Karen Greenwood, Christine Chapman, Mary Holmes, Marjorie Brown, Barbara Robinson, Joan Kirk, Phylis Holt, Enid Hoggard, Josie Lowther, Denise Young, Anne Lilley, Audrey Robinson, Mary Hardcastle, Leslie Binnington, David Watkinson, Malcolm Hoggard, George Gilbert, John Brown. Front row: Alan Taverner, Brian Kirk, Michael Gaskin, Peter Gaskin, Geoff Smith, David Thorley, Terence Clark, Hilary Crabtree, Jennifer Binnington, Rita Malcolmson, Jennifer Nurse, Anne Jackson, Jackie Robinson, Trevor Laverack, Colin Myers, Eric Brown, ?, ?, Keith Wilson.